In November, we introduced you to Theo and Beau, a diminutive duo, that subsequently stole the Internet’s heart. As a holiday gift to everyone, the magic continues on blogger Jessica Shyba’s Instagram account. 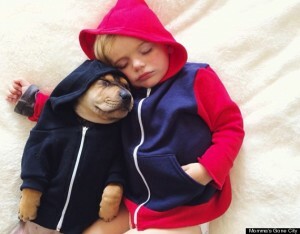 via 22 New Chapters In The Most Adorable Naptime Love Story Ever. If you have not seen this photo stream of Theo and Beau, you are missing a delightful experience! Jessica Shyba has captured the innocence of a child and his dog…both of whom are attached to each other and are each other’s soul-mate at nap time. For the holidays…if you are looking into getting a dog…please consider going to your local ASPCA or Animal Shelter and rescue a puppy or an older dog that needs a home. Mixed breeds make wonderful family members. Pets are known to actually lower your blood pressure and make you more relaxed…they help people especially those who are older, stay healthier because they live on a schedule of eating and exercising…they are also less lonely. Make a pet choice carefully, the shelters will help you to understand the responsibilities of pet ownership and make an appropriate choice.